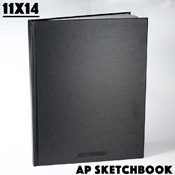 Question: I was wondering if this black book would go well with the molotow one4all markers? I've had black books with terrible bleeding from other companies. Answer: (AP Reply) One4alls are a paint marker, meaning they shouldn/t bleed through paper like alcohol based markers. . We always suggest using a bleeder/ blotter sheet underneath your paper to prevent it from going on to your next sheet. You want markers to bleed through, this means they will blend well and have vibrant colors.